Tonight's manis feature beetles and bugs. Let's start with the bugs. Lady Bugs. 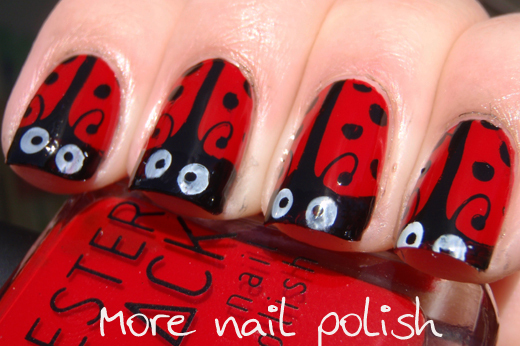 For these lady bugs I painted my nails red, using Kester Black nail polish. I'll have a seperate review of a whole bunch of Kester Black nail polishes soon as I only just got them, but if this red is anything to go by, then colour me impressed. This is one coat of Kester Black Cherry Pie. 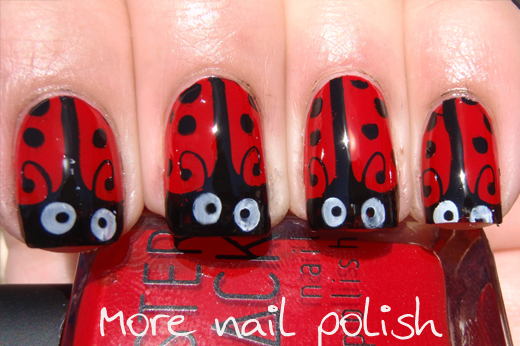 I then stamped the lady bug design from Messy Mansion plate MM17 on each nail. After that was dry I stamped the little white eyes, also from the same plate. I'm still working on my placement of stamps and feel pretty good about the placement of the black, but the white eyes are a little sideways on some bugs making them look a little crazy. 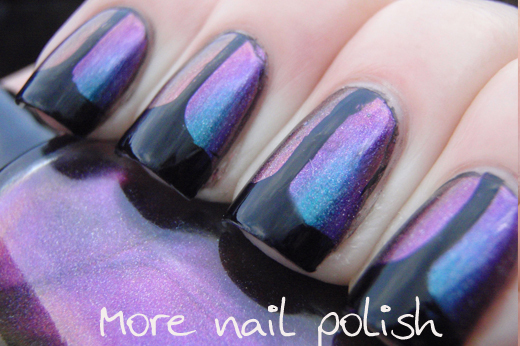 For my beetle mani I started with a black base and did two coats of Enchanted Polish Magical Mystery Tour. MMT is dupy of Ozotic Mish Mash 532. I then stamped with the beetle wing design form Messy Mansion plate MM14. I didn't quite get the same placement on each nail, but it wasn't that noticable in real life, only when I lined up my nails for a photo like this! The stamping images on these plates are really big, so if you have long nails you wont have any problems. Because my nails are pretty short at the moment, I didn't get many dot on my lady bug nor did I get any of the wing lines from the beetle wing. 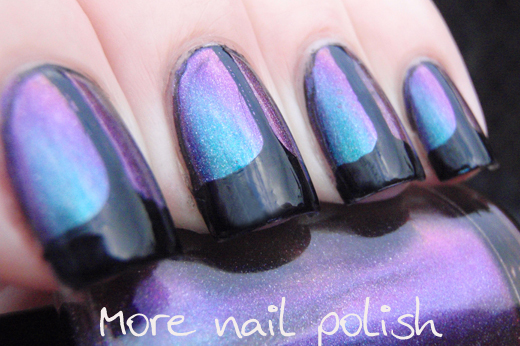 My next mani from this plate is going to be the dragonflies, I think they look awesome! Messy Mansion plates are available from Messy Mansion for $7 and they ship internationally. I love how full the nail plate is with designs, no wasted space means for images to stamp on my nails! Love the plate, so cute! Just great! I would have had no idea this was done with a plate! 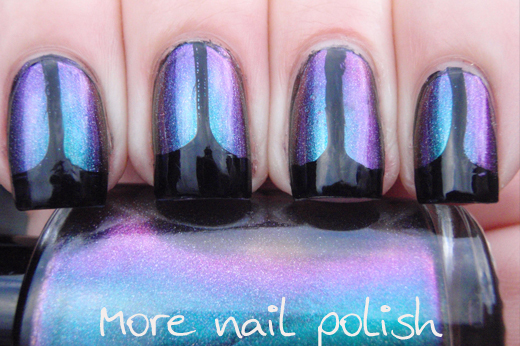 I'm also a nail polish addict, and just posted a NOTD if you're interested. 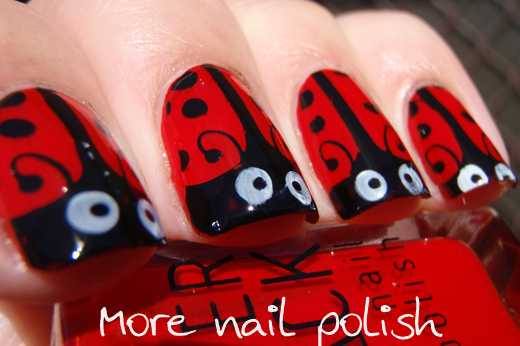 I really like the ladybugs.